The first panel of the day at the LISA2013 conference is solidified! It’s moderated by Christiane Paul, Adjunct Curator of New Media Arts at the Whitney Museum and Associate Professor, School of Media Studies at The New School. Christiane is one of the premier curators in this field. Confirmed for the panel, which will explore the inclusion of digital and new media works in museum and gallery settings and what makes digital works suitable for collection, is artist and filmmaker Lynn Hershman Leeson. Over the last three decades, Lynn has been internationally acclaimed for her pioneering use of new technologies and her investigations of issues that are now recognized as key to the working of our society: identity in a time of consumerism, privacy in a era of surveillance, interfacing of humans and machines, and the relationship between real and virtual worlds. In 2004, she was named “the most influential woman working in New Media”. Lynn released the ground-breaking documentary !Women Art Revolution in 2011. It has been screened at major museums internationally and named by the Museum of Modern Art as one of the three best documentaries of the year. She wrote, directed, produced and edited the feature films Strange Culture, Conceiving Ada, and Teknolust. All featured Tilda Swinton and were showcased at the Sundance Film Festival, Toronto International Film Festival and Berlin International Film Festival. Lynn has been honored with grants from Creative Capital, The National Endowment for the Arts, Nathan Cummings Foundation, Siemens International Media Arts Award, Lifetime Achievement from Siggraph, Prix Ars Electronica, and Alfred P. Sloan Foundation Prize for Writing and Directing. The Digital Art Museum in Berlin recognized her work with the d.velop digital art award (d.daa), for Lifetime Achievement in the field of New Media. Lynn Hershman Leeson received a John Simon Guggenheim Memorial Foundation Fellowship. Her working archive was acquired by Stanford University Special Collections Libraries. Her work is featured in the public collections of the Museum of Modern Art, William Lehmbruck Museum, The Los Angeles County Museum of Art, The National Gallery of Canada, Walker Art Center, The Whitworth Art Gallery, Manchester and the University Art Museum, Berkeley, in addition to celebrated private collections and in shows and retrospectives at Kunsthalle Bremen, the Tate Modern, and Zentrum fur Kunst Und Medientechnologie. Lev Manovich, who literally wrote the book on New Media Art theory, will also be participating on the panel. Lev’s recent book in critical aesthetics, Software Takes Command, examines interfaces and tools. Manovich has been working with computer media as an artist, computer animator, designer, and programmer since since 1984. His art projects have been presented by, among others, ZKM, The Walker Art Center, KIASMA, Centre Pompidou, and the ICA (London). Manovich is a Professor in Visual Arts Department, UCSD, a Director of the Software Studies Initiative at California Institute for Telecommunications and Information Technology, and a Visiting Research Professor at Godsmith College (University of London), De Montfort University (UK) and College of Fine Arts, University of New South Wales (Sydney). Lev’s awards include National Endowment for the Arts Humanities High-Performance Computing, Guggenheim Fellowship, Digital Cultures Fellowship from UC Santa Barbara, Fellowship from The Zentrum für Literaturforschung, and Mellon Fellowship from Cal Arts. Manovich also been a visiting professor all over the world. He has an M.A. in Experimental Psychology (NYU, 1988) and a Ph.D. in Visual and Cultural Studies from University of Rochester . Lev’s Ph.D. dissertation “The Engineering of Vision from Constructivism to Computers” traces the origins of computer media, relating it to the avant-garde art of the 1920s. Magda Sawon is the co-founder and co-director of Postmasters Gallery in New York City, which opened in 1984 in the Village and since has found homes in Soho, Chelsea and Tribeca. Postmasters actively seeks new forms of creative expression and shows them in a context of painting, sculpture and photography, video and new media. The artworks are generally content oriented, conceptually based, and reflective of our time. She will be joining the panelists in the discussion, along with John F. Simon. John has been producing art professionally for 20 years beginning with hand and pen plotter drawings and progressing through Internet Art to finally arrive at his own practice of ‘coding as creative writing’. The main way that he shows his Software Art is through sculptural wall hangings with LCD screens that he calls ‘art appliances’ and has made and sold since 1999. 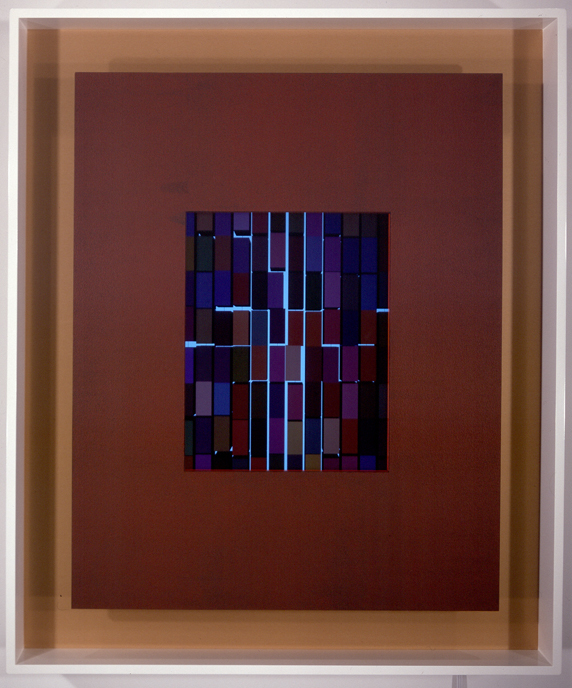 Color Panel v1.0, John’s first ‘art appliance’, was published as an edition of 12 and shown at the Sandra Gering Gallery in New York in 1999. It was acquired at that time by the Whitney Museum of American Art, the Solomon R. Guggenheim Museum, and the San Francisco Museum of Modern Art. Shortly after, his premier piece of Internet based Software Art, called ‘Every Icon’, was included in the 2000 Biennial Exhibition at the Whitney Museum of American Art. His work was shown again at the Whitney Museum in 2001 in their survey of computer-based work ‘BitStreams’. John has shown new work with the Sandra Gering Gallery regularly for 14 years. His work has international exposure including large surveys like Media City Seoul 2002 (Seoul, Korea) and Flower Power at the Musee des Beaus-Arts in Lille, France, and a retrospective at Collezione Maramotti, 2009, (Bologna, Italy). John’s work has been commissioned by the Guggenheim Museum and is in the print collection at MoMA. He’s received the Trustees Award for an Emerging Artist from The Aldrich Museum for Contemporary Art and a Creative Capital New Media Grant. Additional Software Art Appliances can be found in the collections of the Museum of Modern Art, The Los Angeles County Museum of Art, Brooklyn Museum of Art, Ulrich Museum of Art, The Tweed Museum of Art, and the Albright-Knox Art Gallery among many others. We are really looking forward to our first panel at the LISA conference on November 1! Please join us! Top Image: Lynn Hershman Leeson’s 1999-2002 web project Agent Ruby exhibited at SFMOMA in Spring of 2013.